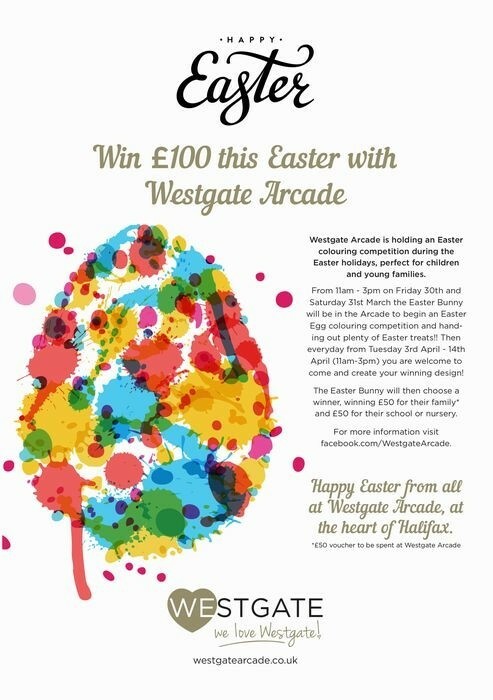 Starting on Friday 30 March 2018 and perfect for children and young families, Westgate Arcade is holding an Easter Colouring competition during the Easter Holidays! From 11:00am to 3:00pm on Friday 30 and Saturday 31 March the Easter Bunny will be in the Arcade to begin an Easter Egg colouring competition and handing out Easter treats. Then every day from Tuesday 3 April to Sunday 14 April (11am – 3pm) you are welcome to come and create your winning design! The Easter Bunny will choose a winner, winning £50 for their family (voucher to be spent at Westgate Arcade) and £50 for their school or nursery. This entry was posted in Apr, Events, Mar and tagged Westgate Arcade. Go Up Wainhouse Tower on Easter Monday! Reblogged this on Halifax Central Initiative.